Samsung, the largest OEM of mobile phones in the world,has never taken a break in innovation. The company continues to spoil people with its range of products that integrate sophisticated communication and connectivity, entertainment, and productivity. incorporating multimedia files—pictures, sounds or even video clips with Easy Clip—into S Note or a document has never been easier and seamless. All these are done on multiple windows and also Multiscreen, another shining feature other smartphone products are yet to have. Creativity knows no bound, and highly intuitive Samsung GALAXY Note II’s S Pen is the perfect way to express it. With S Pen bringing out the artist in everyone or boosting productivity with the ultimate degree of comfort is never easier. The HD Super AMOLED 1280×720 pixel size capacitive touchscreen provides crystal-clear display ensuring you a comfortable viewing of its 5.5-inch screen. Those who often work with graphs and tables will appreciate the high resolution Samsung GALAXY Note II has. Another shining feature of Samsung Galaxy Note II which helps users become more productive is Air View feature. With Air View, browsing images on Samsung Galaxy is quick and convenient, as users do not need to open any folders. This in turn will help save time and energy, leaving more time for other productive endeavor. 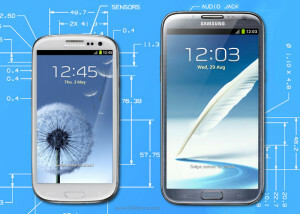 Samsung GALAXY SIII—What Other Smartphones Aspire To Be And what about Samsung GALAXY SIII? This multiple award winning product from Samsung, with its innovative features and breakthroughs, remains a standard bearer for other smartphone products. Samsung GALAXY SIII’s tagline—Designed for Humans—redefines how users interact with Samsung GALAXY SIII and how it connects users to those important to them. With S Beam, sharing contents is now so much easier—not to mention faster and more fun. A light touch of the back of the device will transfer any files to another Samsung GALAXY SIII. Smart Stay, another innovative feature of Samsung GALAXY SIII, automatically adjusts the smartphone to what the users are doing, making sure the setting perfectly fits the users—be it reading an e-book or browsing the web. Burst Shot enables you to continuously capture fast moving objects up to 20 photos and Best Photo automatically recommends the best photo among the 8 photos taken. And with Social Tag, staying connected with the important people is so much fun as viewing their pictures will directly display their status updates. Cream Sandwich operating system and 1.4Ghz Quad Core processor. Its 4.8-inch HD Super AMOLED screen displays images and videos in true colors that are outrageously sharp to provide a vivid viewing experience.There are so many innovations this smartphone has to offer that Samsung GALAXY SIII —awarded the best smartphone of the year by many of the industry’s major media outlets—is what many other martphones aspire to beat.Dream Smartphone Yours To Have And, now, Samsung and XL Axiata Indonesia are working together to make it easier to own these dream smartphones—Samsung GALAXY Note II and Samsung GALAXY SIII—with a remarkable bundling package. This advertorial was published in The Jakarta Globe on March 1, 2013.